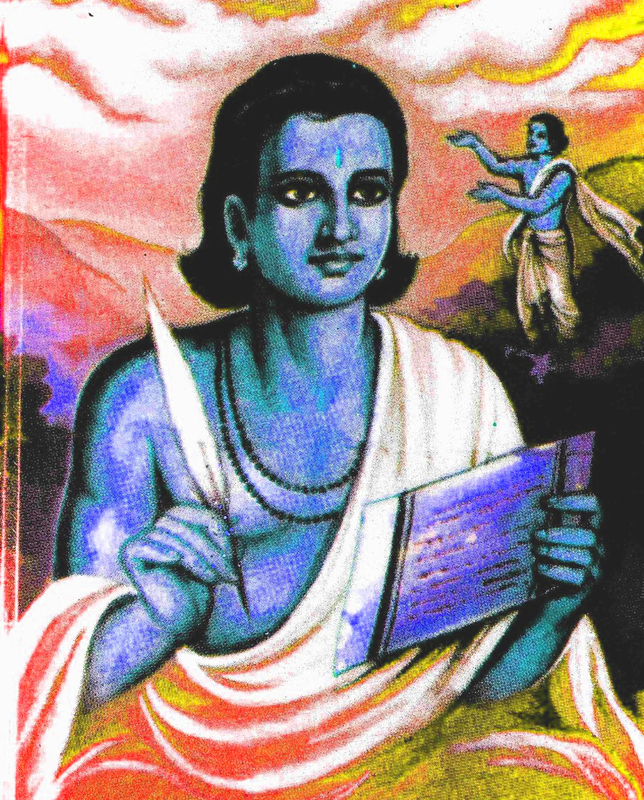 Kalidasa, the great Sanskrit poet and dramatist, is said to have adorned the court of Chandraguta 2 as one of the nine gems. But of his time and origin there is no certainty. Dr S. Radhakrishnan says, `Whichever date we adopt for him we are in the realm of reasonable conjecture and nothing more. Kalidasa speaks very little of himself, ---. We do not know any details of his life. Numerous legends have gathered round his name, which have no historical value.' One of them regarding his early life runs as follows. AbhijnanaSakuntalam (Recognition of Sakuntala) - The story of this play involving Sage Viswamitra, Menaka, Sakunthala, Sage Kanva, King Dushyantha and Sakunthala is very well known. The original story appears in Mahabharatha as well as in Padmapurana. The story has a special place because of the child Bharatha after whom India was named Bharathavarsha. This is one of the first works of Indian literature to become known in Europe. It was first translated to English and then from English to German, where it was received with wonder and fascination by a group of eminent poets, like Goethe. "Here the poet seems to be in the height of his talent in representation of the natural order, of the finest mode of life, of the purest moral endeavour, of the most worthy sovereign, and of the most sober divine meditation; still he remains in such a manner the lord and master of his creation." commented Goethe. The influence of the play outside India is evident not only in the abundance of translations in many languages, but also in its adaptation to the operatic stage by Paderewski and the like. Malavikagnimitra (Malavika and Agnimitra) - Malavikagnimitra is of special interest because the hero is a historical figure, King Agnimitra, whose father, Pushpamitra, wrested the kingship of northern India from the Mauryan king Brihadratha in about 185 B.C. and established the Sunga dynasty, which held power for more than a century. The play contains datable references, the historicity of which have been much discussed. The play also contains an account of the Raajasuuya sacrifice performed by Pushyamitra. In a five act play it tells of the love of king Agnimitra for Malavika, the maid of his chief queen. When the queen discovers her husband's passion for this girl, she becomes infuriated and has Malavika imprisoned, but as fate would have it, Malavika turns out to be a princess in hiding and the queen also relents and all end happily. There are many scenes of light hearted comedy, confusion and confrontation that make Malavikagnimitra one of the finest works of Kalidasa. Vikramorvasiya (Urvasi won through valour)- Vikramorvasiya is based on the legend that occurs in embryonic form in a hymn of the Rig Veda and in a much amplified version in the Shatapathabrahmana and tells the story of King Pururavas and the Apsaras Urvasi who fall in love. As an immortal, Urvasi has to return to the heaven, where an unfortunate accident causes her to be sent back to the earth as a mortal with the curse that she will die and return to heaven, the moment her lover lays his eyes on the child which she will bear him. After a series of mishaps, including Urvashi's temporary transformation into a vine, the curse is lifted, and the lovers are allowed to remain together on the earth. The fourth act on the madness of Pururavas with the extraordinary soliloquy of the demented lover in search of his beloved, is praised as unique. Kumarasambhava (Birth of Kumara) - Kumarasambhava is a mahaakavya that is hailed as one of the gems of Sanskrit literature, The poem narrates how Parvati Devi won the love of Lord Siva in order to bring into the world Kumara (i.e. Lord Karthikeya) to bring about the destruction of demons led by Tarakasura, who had been granted a boon that he cannot be killed by anyone other than the son of Lord Siva. Siva had curtailed the desire for love by intense meditation. Due to the efforts of Manmatha and the penance of Parvati the union of Siva and Parvathy is brought about. The majority of chapters have intimate details about the love and romance between the divine couple. They bring about a son whom they name Karthikeya who grew up and killed the demon and restored the throne of Lord Indra. Meghaduta (Cloud Messenger) - Meghaduta, a short poem of 111 stanzas, is considered one of the masterpieces of world literature and has a most original plot. The poem is a message sent by an Yaksha in exile in the mountains of Central India to his wife in Mount Kailas. The messenger he chose is the rain cloud that was going north. The Yaksha in the message gives a vivid description of the route the cloud should be taking. The description is very captivating and the emotions portrayed are exquisitely beautiful. The description of Himalayan ranges are so vivid that there is a theory that Kalidasa must be originally from Kashmir. Ritu-samhaara (Garland of seasons) – Ritu-samhaara is a poem describing the six seasons of the year in all their changing aspects. The six seasons are Vasantha ritu, the spring; Grishma ritu, the summer; Varsha ritu, the rainy season; Sharad ritu, the autumn; Hemanta ritu, the pre-winter; Sisira ritu, the winter. These seasons are described in a chapter each, through the changes that take place in the minds of a pair of lovers who experience changes in their relationship like the changing seasons. Every change has some good and some bad effects, but in totality it is a pleasant feeling. This is a work of youthful exuberance, not typical of Kalidasa and so the authenticity of authorship by Kalidasa is doubted. Great write up. Congratulations. Thanks.